Quintessential Maine Cottage Overlooking the World Famous Cribstone Bridge! 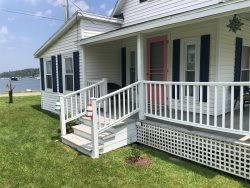 Freshly painted and refurnished with beach access just a stones throw away! We are excited that we now offer a few properties with a 2 night minimum during peak season! Great affordable getaway for a couple. Spacious 1st floor apartment with views of Lowell's Cove on Orr's Island. Sunny 2nd floor apartment with views into Lowell's Cove on Orr's Island.